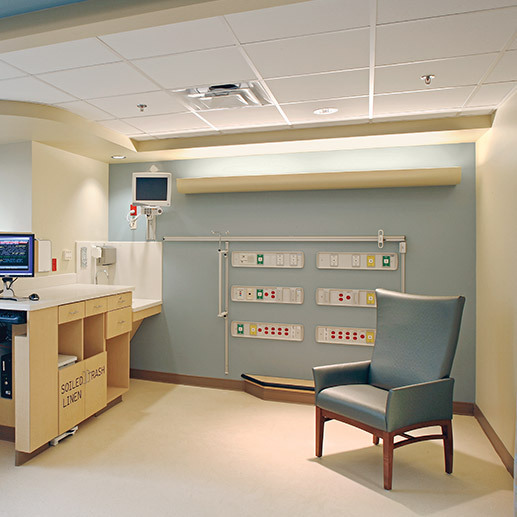 Multi-layers of indirect illumination allow different lighting schemes in the exam rooms of this NICU in Nashville, TN. Mounted to the wall, ELP’s pre-fabricated cove system, the CLC Series, helps to provide a comfortably bright exam room or much softer setting if required. The decorative cast GRG (Glass Fiber Reinforced Gypsum) portion of the cove attaches and blends with the wall, while the metal reflector/fixture attaches within, shielded from view. CLC Series, Style D 10"